It’s that time of year where my brain is not up to much for the ‘season’. 2014 hasn’t exactly been my most triumphant year for blogging. I am so grateful for everyone who’s stuck with QRGHQ and for your insightful comments as always. I’m sure 2015 will be more inspired! Glosswitch’s 2014 ’round up’ also alludes to the notion that some people (not her) accuse feminists of ‘doing it wrong’ and she turns this idea into a satirical list of examples. I don’t get the joke really, because the things she lists in a defensive manner, as if they’ve been ‘falsely accused’ read to me like a list of PR disasters at the very least. From the ‘this is what a feminist looks like’ t-shirt sweatshop debacle, to digs at trans women feminists such as Paris Lees, to unapologetic misandry (for once I feel like defending Ally Fogg here), Glosswitch simply illustrates why #womenagainstfeminism has been one of *the* twitter hashtags of the year, but remains absent from most feminist ’round ups’ of life in the gendersphere in 2014. Where does feminism’s strength come from? All that negative power to do nothing with but complain. 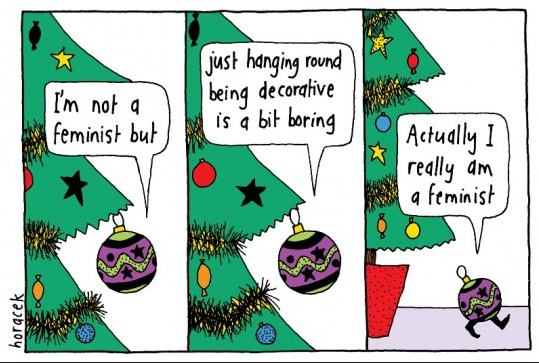 The christmas decoration, metaphor for objectified women, decides to not be objectified but the cartoon suggests to me that she will just go “off” and do nothing but hang around uselessly, alone, being boring. Is the liberation women have been promised by feminism, negative liberty to amount to nothing, not even a baubular level of achievement? The reality is that she’s actually joined a cult.